It's early June, but it's already hot as an oven here in central Texas, with afternoon temperatures soaring to near 100 degrees already -- and Summer is just getting started! All I can think about is having plenty of ice-c0ld beverages and refreshing dishes on hand to combat the brutal heat. 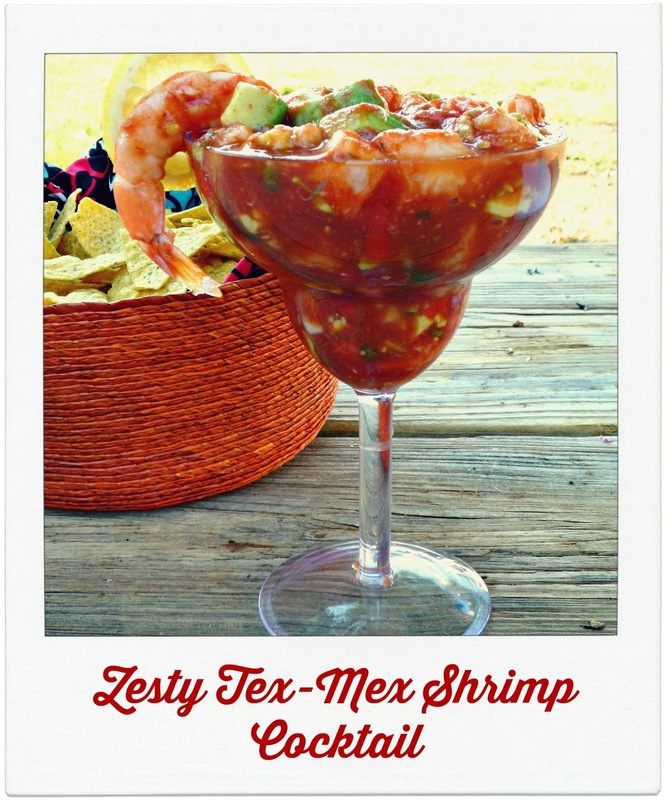 Today, I'm sharing a recipe for Zesty Tex-Mex Shrimp Cocktail. It's super simple to whip up a batch of this appetizer or light lunch/dinner in no time. It's one of the most popular recipes ever shared here, so I wanted to share it again now that cookout season is in full swing. Because it's served chilled, it's perfect for keeping cool on a hot Summer days. If you've never tasted Mexican-style shrimp cocktail (aka coctel del camarones), it's a bit different from the American-style shrimp cocktail you may be used to. 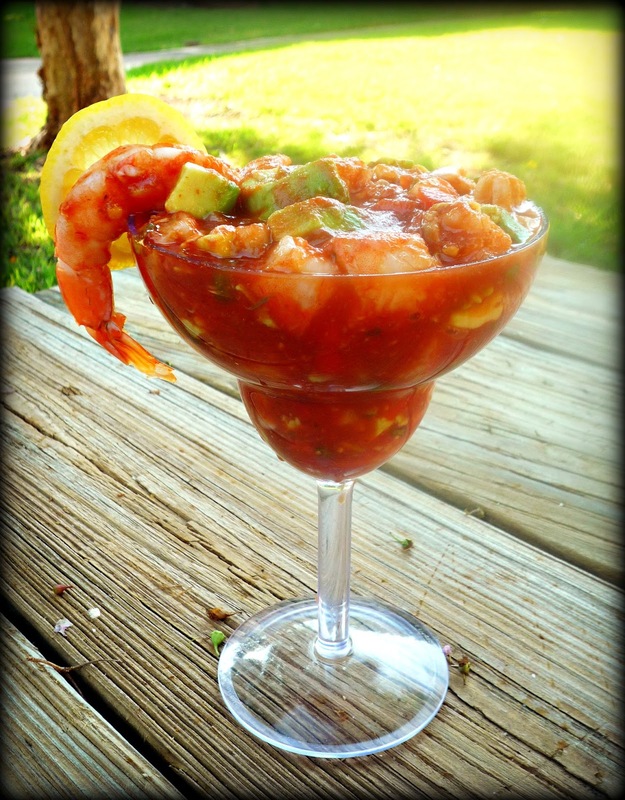 This Zesty Tex-Mex Shrimp Cocktail is my personal spin on a dish that has a zillion different variations. My homemade cocktail sauce is flavored with ketchup, Worcestershire sauce, lime juice juice, and smoky chipotle hot sauce. In addition to chopped boiled shrimp, it contains lots of diced ripe avocado and chunky pico de gallo. The entire dish comes together in about 20 minutes, then it chills in the fridge until you're ready to serve. See Easy! I love to serve this fun appetizer well chilled in two large margarita glasses, with lots of crispy tortilla chips for dipping. Everyone who tastes this appetizer goes crazy for it! Step 1: Boil the shrimp in well salted water. Immerse the cooked shrimp in ice water to quick chill and stop the cooking process. Peel and devein the shrimp, reserving two of the prettiest ones for garnish. Chop the remaining shrimp into bite-sized pieces and add to a large bowl. 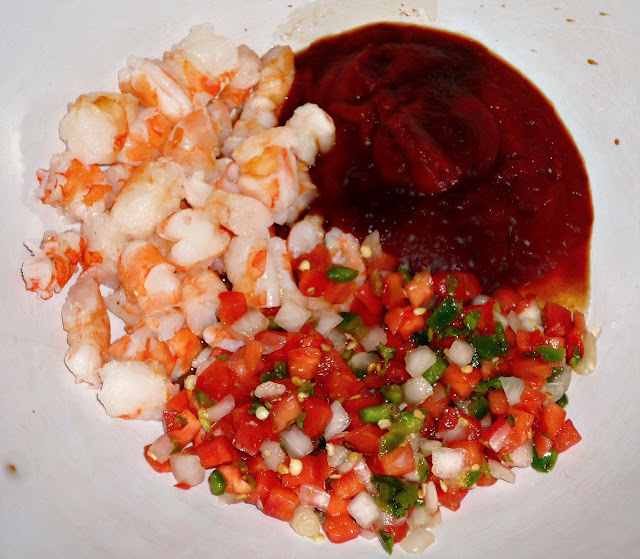 Add the pico de gallo, ketchup, Worcestershire sauce, shrimp cooking water, lime juice, and hot sauce. Step 2: Stir well to evenly combine all the ingredients. 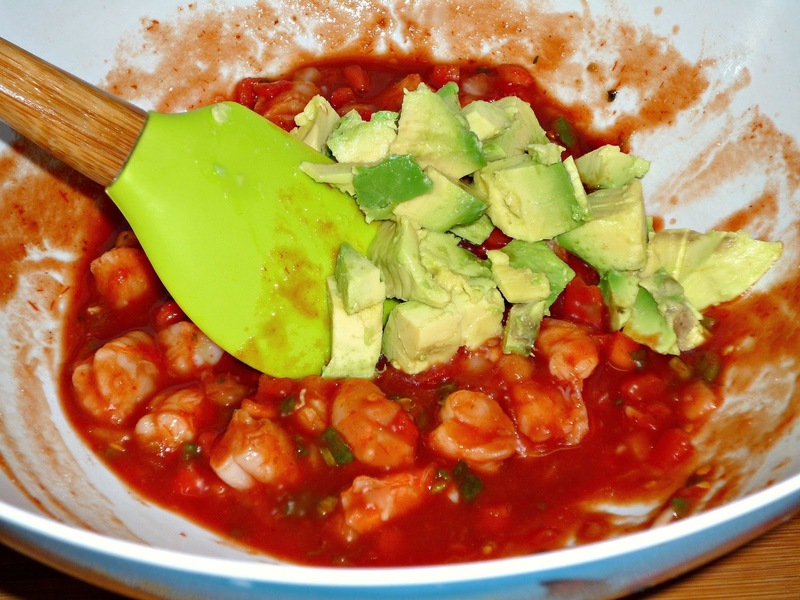 Add the diced avocado to the shrimp mixture and carefully fold into the shrimp mixture. Be gentle so you don't break up the avocado. Add salt and pepper to taste. Step 3: Carefully spoon the shrimp cocktail into a large margarita glass. Cover with plastic wrap and refrigerate until serving time. I try to prepare this appetizer no more than 2 hours before serving to ensure the avocado stays green. Just before serving, add one of the reserved boiled shrimp and a piece of lemon (or lime) to the rim of the serving glass. Serve with baskets of baked tortilla chips for dipping. This easy-to-make appetizer is an amazing combination of flavors and textures. 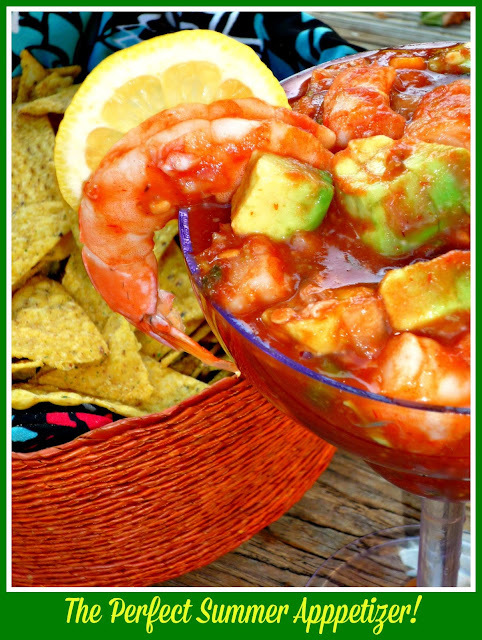 The chunks of sweet shrimp are perfectly balanced by the zesty cocktail sauce and creamy avocado. The finely diced pico de gallo adds plenty of texture and spice. Add it all up, and you've got a winner of a Summer appetizer -- perfect for entertaining and taking to seasonal potlucks. We've been known to make a meal out of this dish...so that's always an option too!